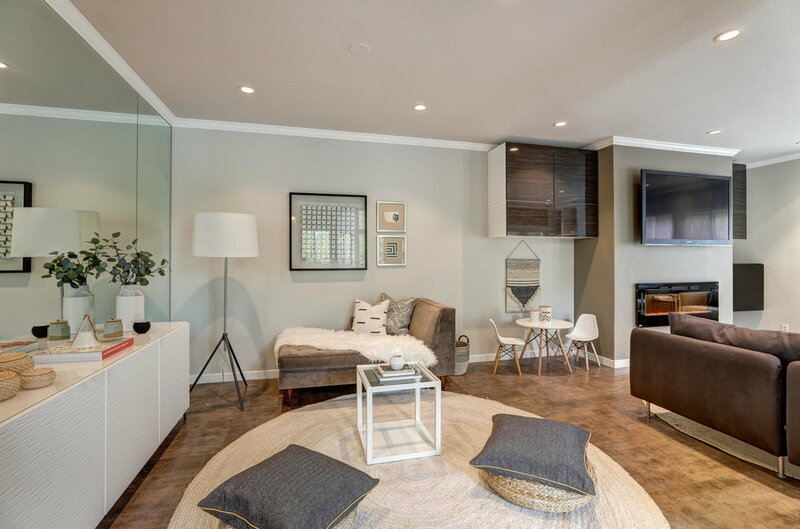 Located in the highly sought-after flats of Corte Madera, 8 Parkview Circle is a stylishly remodeled town home that lives and feels like a single-family home. With the largest floorplan in the complex, 8 Parkview Circle enjoys privacy, wonderful natural sunlight, an open floor plan with high ceilings, a large two-car attached garage with ample storage space and a huge fenced-in backyard off of the living room to entertain friends and family. Directly across the street from a large community park and in one of the best commute locations available from Marin to San Francisco and the East Bay. 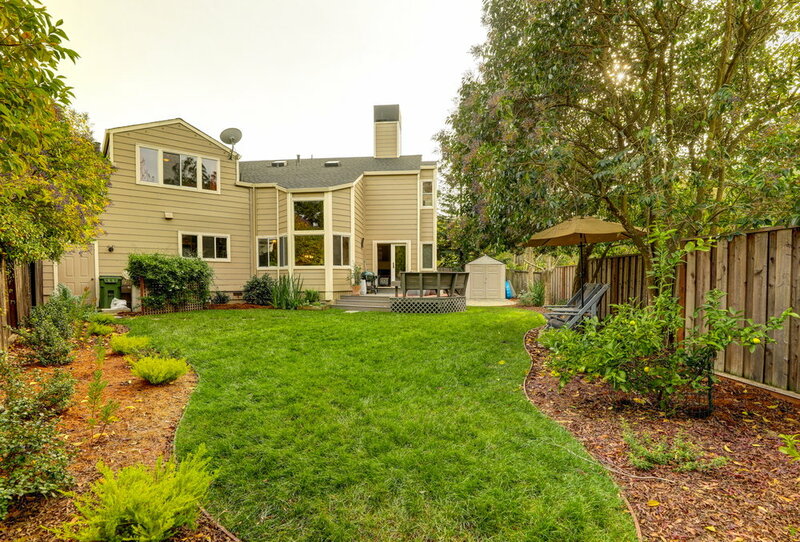 8 Parkview Circle is also within walking distance to the Nugget Market, the Village at Corte Madera, Larkspur Ferry Terminal, Ring Mountain Open Space Preserve and the coveted Cove Elementary School that receives rave reviews for its highly ranked educational program and family community. A short drive to Marin’s favorite restaurants and coffee shops including Marin Joe’s, Il Fornaio, Philz Coffee, Joe and the Juice, Pacific Catch, Boca Tavern and the new Flores, it’s hard not to fall in love with the lifestyle 8 Parkview Circle has to offer. 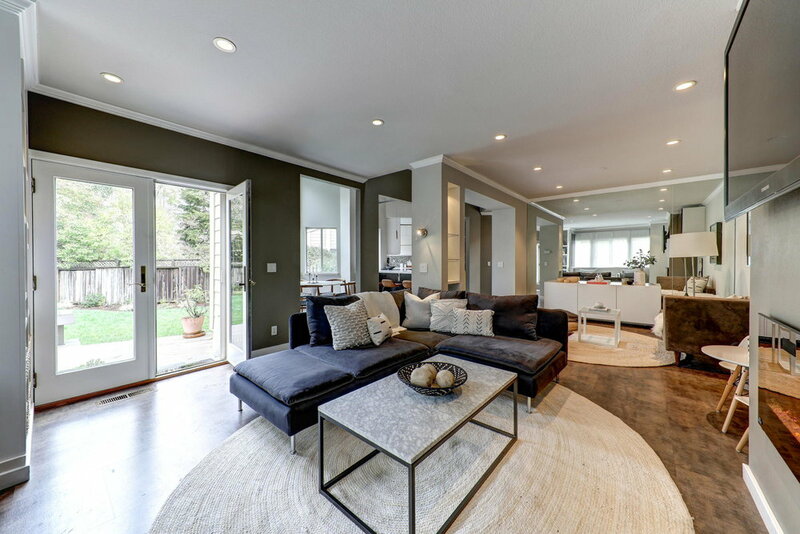 This spacious 1,901± square foot home has been completely remodeled with modern finishes and fixtures throughout. Owners enjoy pulling into their own 2-car attached garage which also provides ample storage with built-in work-benches and an electric car charger. 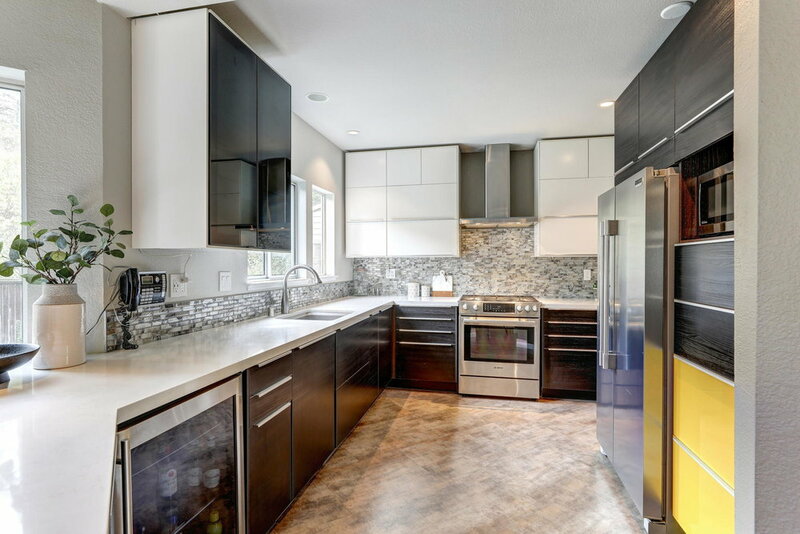 The gourmet kitchen features stylish modern cabinetry, top of the line stainless steel appliances, a Bosch 5-burner gas range with electric convection oven, Caesarstone countertops with bar seating for three and a bar fridge. 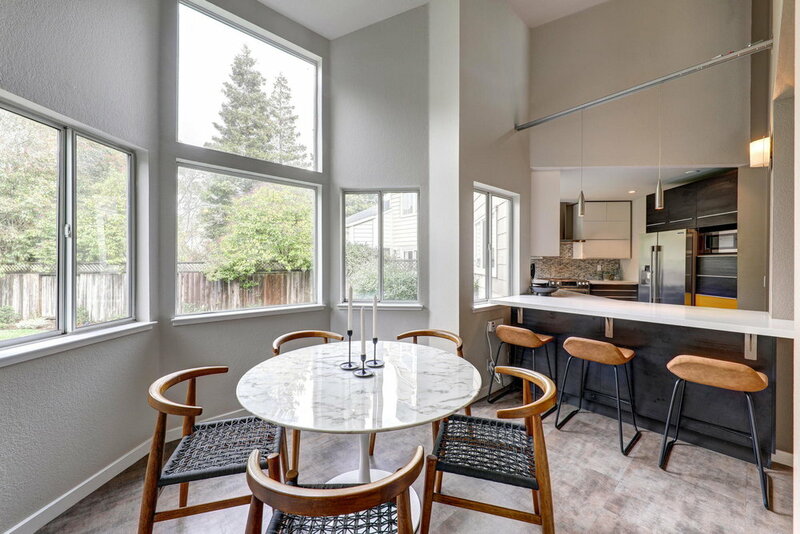 Adjacent to the kitchen is a spacious dining area with a wall of windows overlooking the backyard and embracing natural sunlight. 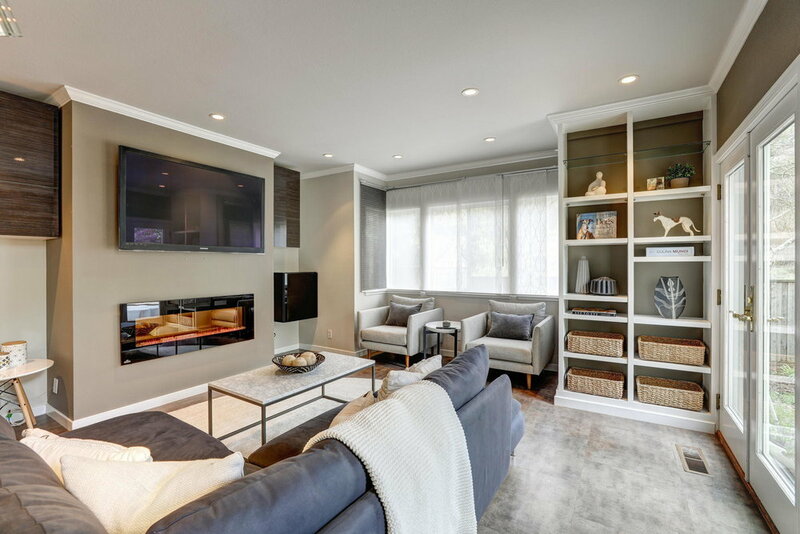 The adjacent living room is the perfect cozy hangout featuring an electric fireplace and dimmable recessed lighting with french doors that lead to a sunny, private, built-in back deck perfect for barbecues and outdoor entertaining. The large, sun-filled backyard has been beautifully landscaped and includes fig, lemon, and lime trees, an herb garden, beautiful camelias and an automated irrigation system to make yard maintenance a breeze. 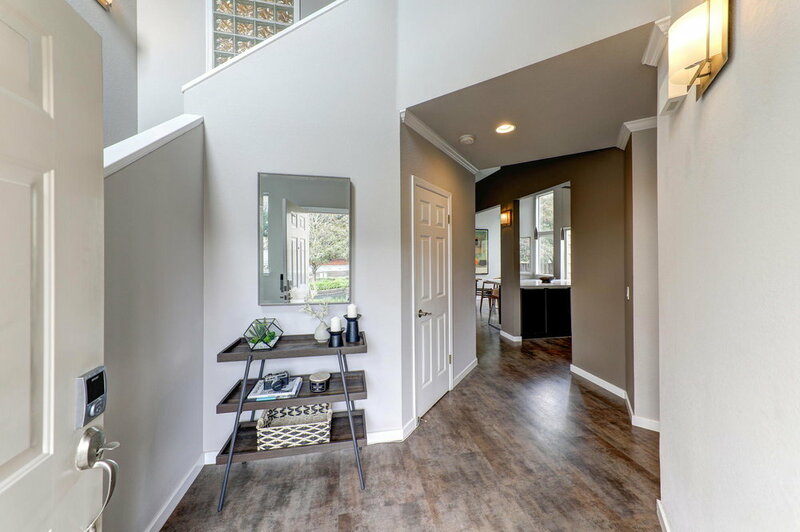 The upper level features three large bedrooms including a large master suite with vaulted ceilings, three closets, soaring windows overlooking the yard and a remodeled master bathroom with a step-in shower. 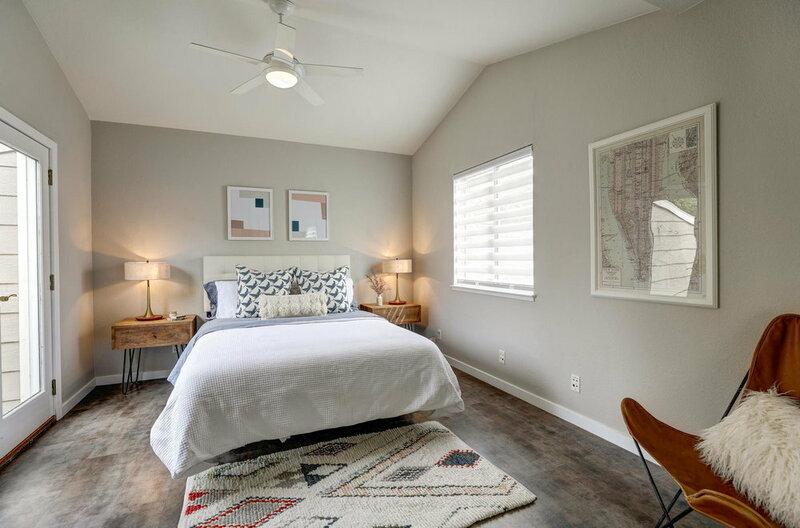 A large second bedroom is currently being utilized as a two-person office but could make the ideal guest bedroom or kids room with a private deck overlooking the backyard. The room includes a bonus reading nook, play area, artist’s or meditation studio. The third bedroom is the perfect size for guests or teens with a large closet and ample natural sunlight. The location of 8 Parkview Circle cannot be beaten. 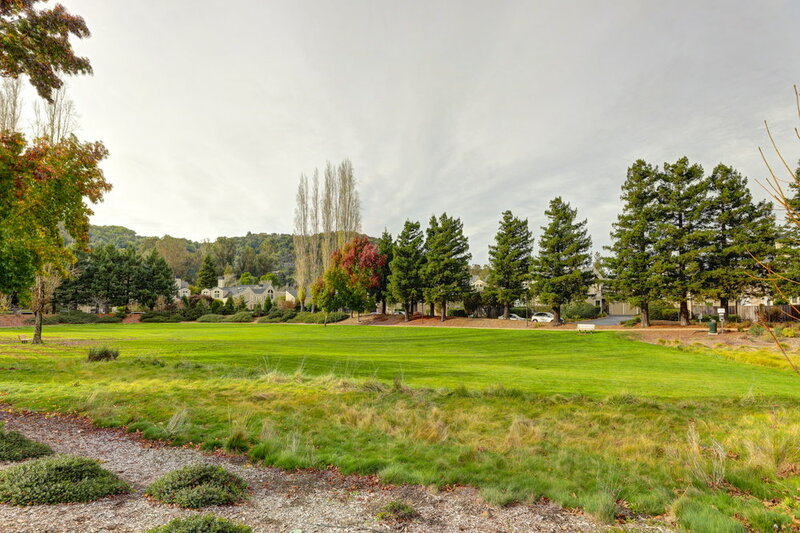 Enjoy everything the flats of Corte Madera has to offer just blocks away from award-winning schools, parks, public transportation, some of Marin’s favorite hiking + biking trails and the best shopping in all of Marin. Containing just over 9,000 residents, Corte Madera is a small town with a big community. You'll find family-friendly neighborhoods and a vibrant community of residents who enjoy hiking, biking, supporting education and participating in community events. The Larkspur Ferry Terminal: 10 minutes by car. The Golden Gate Bridge: 15 minutes by car. Downtown San Francisco: 30 minutes by car. Napa Valley: 75 minutes by car. Whole Foods, Nordstrom, Restoration Hardware, Apple Store, REI, Bluebarn, Starbucks and local hot spots, 5 minutes by car. Typically sunny, with the summer average highs in the mid 80's and winter lows averaging in the 50's. Check the current forecast by clicking here. Corte Madera residents have access to award-winning public and private schools from K-12. Students can attend The Cove, Neil Cummins Elementary, Hall Middle School and Redwood High School. For residents looking for a private school atmosphere, Marin Primary provides an innovative learning environment where students from preschool through eighth grade are empowered to strive and prepared to thrive. Learn more about the Corte Madera Public School District here. With several parks and open space preserves in the area, you'll be able to see many different sides of Corte Madera. The Ring Mountain Open Space Preserve is a two-mile-long loop through the rocky grasslands near the San Pablo Bay, this Corte Madera trail is an easy hike with only a few short, steep sections. The Blithedale Summit Open Space Preserve consists of a multitude of habitats, from dense chaparral to deep forests, its trails will lead you through quiet redwoods with sword ferns and huckleberries. With Corte Madera's natural beauty and nice weather throughout the year, you'll enjoy both off-road trails and bike paths for exploring the area. Featuring safe paths and trails for all levels of experienced riders, Corte Madera is the perfect place to work up a sweat while exploring the town. Click here for bike maps from the Marin County Bicycle Coalition. Corte Madera is accessible to a variety of fitness centers in and around town to choose from including The Bay Club Marin, SoulCycle, 24 Hour Fitness, TJ's CrossFit, Mt. Tam Racquet Club, YogaWorks and Pilates Pro Works. ﻿Enjoy certified organic farm fresh & local seasonal fruits & vegetables, fresh cut flowers, baked goods, artisan foods at the Corte Madera Farmers Market every Wednesday (year round) from 12-5pm at the Corte Madera Town Center Courtyard. Safeway, Paradise Foods and the Nugget Market are Corte Madera's most frequented grocers. In the neighboring towns you'll have access to Whole Foods, Woodlands, Trader Joes and Molly Stones only 10-15 minutes away. The Corte Madera Shopping Center & Town Center provides the best shopping Marin County has to offer. You’ll be a short walk or drive to renowned merchants including Nordstrom, J. Crew, Banana Republic, Gap, William Sonoma, Apple, Anthropologie, Lululemon, Madewell, Urban Outfitters, REI, Athleta, The Container Store, Crate & Barrel, Restoration Hardware, Pottery Barn, Verizon Wireless, Macy's and so much more.